On October 24, 2017, The New York Times ran a front-page story that claimed that "Republicans and business lobbyists" are afraid that President Trump's "bully-pulpit whims" could undermine a sweeping rewrite of the tax code, thus upsetting the Republicans' best chance "in decades" to achieve the party's top legislative priority. Reducing taxes for rich people does, indeed, seem to be the main legislative objective of the Republican Party, which is eagerly working to respond to the desires of those "business lobbyists" who provide the party leadership with campaign cash. 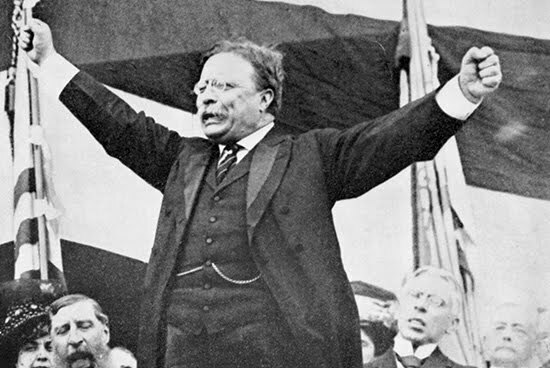 Back in the day of Theodore Roosevelt (pictured), the president's "bully pulpit" was the place that the president advocated for progressive reform. That Republican president was pretty much batting for the common folks, not the already-wealthy elites. How times do change! A bully pulpit is a conspicuous position that provides an opportunity to speak out and be listened to. This term was coined by United States President Theodore Roosevelt, who referred to his office as a "bully pulpit," by which he meant a terrific platform from which to advocate an agenda. As the picture shows, Roosevelt's "bully pulpit" was, literally, a "platform," from which the president spoke to the crowd. His bully pulpit speeches were intended to influence public opinion, with the expected result being that those in the crowd who heard the appeal would prevail upon those who were actually able to make the law (Members of Congress), and that the roar of the crowd, focused on the elected representatives, would compel those representatives to do what the majority wanted. "Tweeting" 140-word comments and complaints, is something quite different. While millions might "receive" one of the president's Tweets, and while these Tweets are routinely commented upon, and thus "rebroadcast," in the conventional media, messages on Twitter are directed at people individually, not to people as they gather in a crowd. Furthermore, these Tweets can never present any extended thought or idea. Maybe "bully pulpit whims," the description used in the Times' article, is getting at the truth. When statements are truncated at 140 words, they do seem more like a "whim," a "capricious or eccentric and often sudden idea or turn of the mind," than any kind of a statement that should be taken seriously. I don't, in other words, think it's correct to say that the president's Tweets are anything like a modern day version of the "bully pulpit." The President is no progressive. He's no Teddy Roosevelt, and his public statements by Tweet are not a sustained appeal to the public, urging a focused program of political action. They are, instead, capricious (and I would say captious) comments that ought to be ignored, and not either rebroadcast or taken seriously for their policy implications. My worry about the president's Tweets go beyond the fact that they are given more attention than such capricious statements ought to receive. I worry that the president seems to think that what he says in his free-ranging Tweets should be treated as though these statements are equivalent to an Executive Order, a statement of the president's will that should then be obeyed. Back in July, as reported in the Times, "President Trump abruptly announced a ban on transgender people serving in the military ... blindsiding his defense secretary and Republican congressional leaders with a snap decision that reversed a year-old policy reviled by social conservatives. Mr. Trump made the declaration on Twitter, saying that American forces could not afford the 'tremendous medical costs and disruption' of transgender service members." The president's Tweet was most emphatically not a "decision," which is what The Times called it. And, in fact, the leadership of the armed forces ignored the statement. They could not properly have done that, had the president's Tweet actually been a "decision," or a legitimate presidential "order." When we start thinking that a 140-word Tweet, fired off in the early morning hours, should set the government in motion, we are on the way to autocracy, with the "whims" of our Chief Executive determining how government will work. We are, in other words, on a slippery slope. A true "bully pulpit" speech is an appeal to "the people," with a specific policy program in view, and represents an effort to make representative democracy work the way it's supposed to. Tweets are definitely not like that! We have got to watch our word choices, I think, or we will end up confusing ourselves, and the result will not be good!